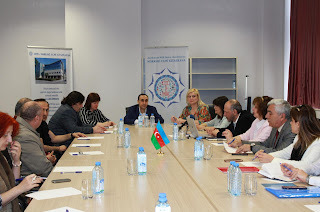 At the Central Scientific Library of ANAS a press conference of the Working group on the Comparative Study of Spiritual Traditions and Interreligious Dialogue was organized by UNESCO. A Working group called "In search of the Sun" consisting of scholars and researchers from different countries has been established with the initiative Center for the history of Caucasus, UNESCO's Comparative Study of Traditions, Cultural Heritage and Inter-Religious Dialogue. 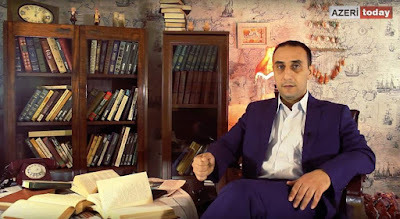 The working group consists of scholars and researchers who study and encourage the architectural, cultural, moral, ethnographic and historical heritage of Azerbaijan. The group also includes scientists from Azerbaijan, Turkey, Kazakhstan, Russia, Ukraine, Georgia. In the future it is planned to involve scientists and researchers from other countries. The Working group includes Deputy Chairholder of UNESCO Chair in Comparative Studies of Spiritual Traditions, their Specific Cultures, and Interreligious Dialogue dr. Alina Venkova; archaeologist, Ukrainian historian dr. Tatyana Krupa; director of the European Cinema Academy dr. Alexander Rusnak; employee of Baku International Multiculturalism Center, doctor of historical sciences Hajar Verdiyeva; deputy director of the Institute of Architecture and Art of ANAS, dr. Imash Hadjiev; head of the Albanian-Udi Christian community, senior researcher of the Baku State University, dr. Robert Mobili; head of Department at the Institute of Archeology and Ethnography of ANAS, archaeologist Farhad Guliyev; artist-ceramist Mir-Teymur Mammadov; historian-linguist Elshad Alili, historian Abbas Islamov; researcher at the Central Scientific Library of ANAS, Renat Djafarov; ethnographers Elshan Huseynov, Elbrus Mammadov, Elvin Gahramanly, Sabit Gurbanov and others. We note that the composition of the Working Group is expanding. The head of the Working group "In search of the Sun", director of the Center for the history of Caucasus, Senior Research Fellow at the Institute of Law and Human Rights of ANAS, Associate Professor of UNESCO Rizvan Huseynov noted that the reason for the creation of the working group is the gaps in the field of cultural heritage: "The representatives of different countries are represented in this working group. Members of the Working Group are ready to support us with our monuments. Our main activity is to ensure both the passportization of the monuments and the preservation of these monuments with the help of the local population. Restoration of monuments is a difficult technical and financial process. There is a need for state support here. Deputy Chairholder of UNESCO Chair in Comparative Studies of Spiritual Traditions, their Specific Cultures, and Interreligious Dialogue dr. Alina Venkova said that UNESCO has started the project on introduction and certification of historical monuments in Azerbaijan. Then the archaeologist, Ukrainian historian Tatyana Krupa spoke about the problem of preservation of historical and cultural heritage in the occupied territories of Azerbaijan. It was also noted at the conference that the concept of the project on study, passportization and protection of the ethnographic and cultural heritage of the whole region is planned. At the first stage, which dates back to April 24-29, 2018, a project on the passportization of ancient monuments, tombs, coaches (totemic stone sheep and horse sculptures) and temples is planned in the western region of Azerbaijan. This activity will be coordinated with the activity of ANAS, Ministry of Culture and local executive authorities. At this stage an international archaeological ethnographic expedition will be formed which will begin the project implementation in spring and summer 2018. A film about the results of the work will be prepared and articles will be published. The Working Group intends to expand its cooperation with UNESCO and the International Turkish Cultural and Heritage Foundation, as well as with government agencies and public organizations specializing in the study and protection of historical heritage.